RENOVATIONS 198 • SHOPPING CENTER BUSINESS • May 2018 T he United States currently has nearly six times the per capita retail square footage when compared to that of Europe, a sobering statistic. One only needs to picture the endless streets of boutiques, dining and entertainment offerings in any European city to con- clude that the U.S. has more than its fair share of existing space that is currently un- der-exploited. Combine this abundance of existing retail space with the shrinking formats of many retailers and the shift to online shopping in a portion of the sec- tor, and you have an environment ripe for renovation. 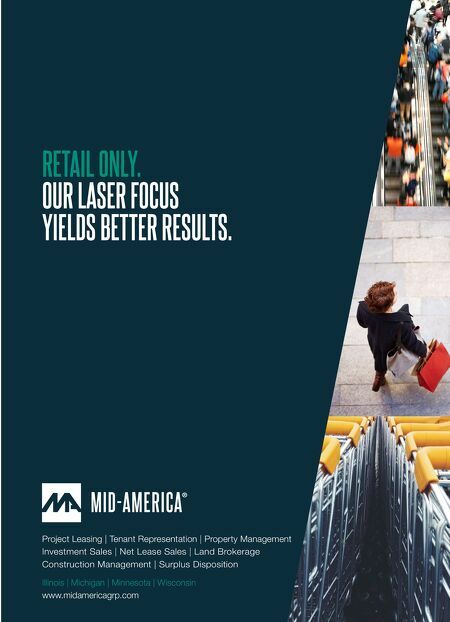 The lifespan of retail interiors is said to be, on average, five years or less in the cur- rent retail climate. This means retail spac- es are refurbished at an accelerated rate when compared to that of other types of interiors. The renovation of existing retail space is not simply an effective strategy to- ward the reabsorption and repurposing of retail real estate, it is a necessary evolution of the built environment. While many retailers are downsizing their footprints, there is still a continu- ous stream of exciting new retail concepts entering the brick-and-mortar platform in addition to some existing brands actual- ly expanding the square footage of their prototypes. The Las Vegas market alone is seeing a variety of retail projects from simple suburban retail centers to new flag- ship locations along Las Vegas Boulevard. Between the $1.4 billion Las Vegas Con- vention Center expansion and the new, $2 billion NFL stadium — not to mention expansions from Wynn and the Genting Resorts World project — there is a tremen- dous amount of activity in the valley that translates to growth from The Strip out to the more residential submarkets. As a result, the retail sector must keep up. 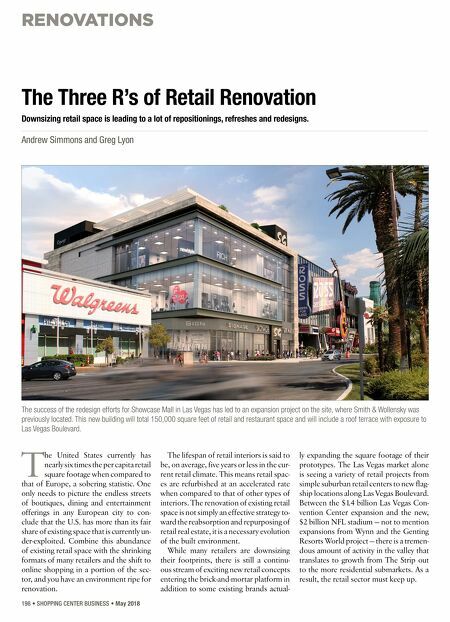 The Three R's of Retail Renovation Downsizing retail space is leading to a lot of repositionings, refreshes and redesigns. Andrew Simmons and Greg Lyon The success of the redesign efforts for Showcase Mall in Las Vegas has led to an expansion project on the site, where Smith & Wollensky was previously located. This new building will total 150,000 square feet of retail and restaurant space and will include a roof terrace with exposure to Las Vegas Boulevard.